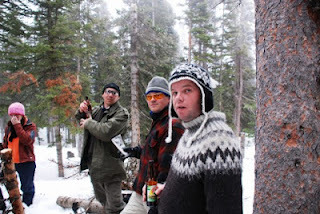 Last weekend some friends and I were finally able to make it up into the mountains for our annual snowcave camping trip. The area where we camp is at 10,200’ in elevation outside of Ward, CO. This area gets a good amount of snow and lots of wind that creates large drifts. 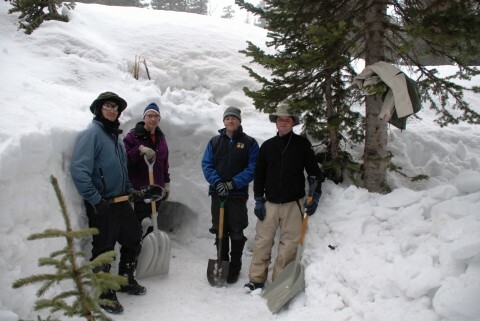 We dig down, in, and up into these drifts to build our caves. A storm on the previous weekend, our original trip date, dumped over three feet of new snow in that area. Luckily we postponed the trip, because we would have never made it close to our usual camp location. Constructing a good cave takes a lot of hard work. After several hours we are all soaked inside (from sweat) and out (from digging & moving snow and from the elements). 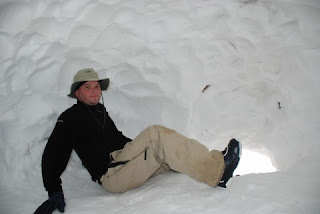 But a properly constructed cave is very cozy and warm. We’ve been doing this since the early 90’s, so at this point we are pretty good at the process. 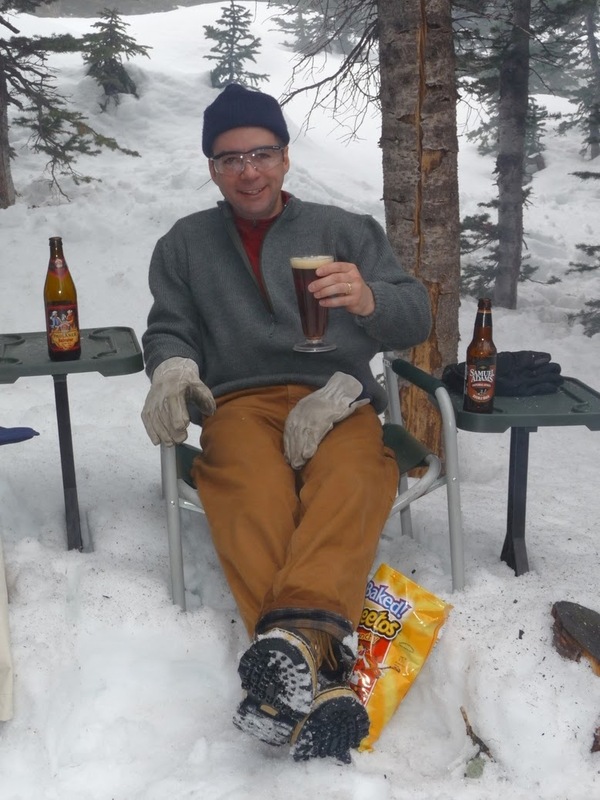 And the hard work is well worth the effort, because after we are done we get to crack open a few beers. They are well earned, and taste better because of the sense of accomplishment. Luckily our camp spot is only a quarter of a mile from our vehicles, so we don’t have to skimp on gear, supplies, or beer. After arriving and before digging, we take care of our bottles. 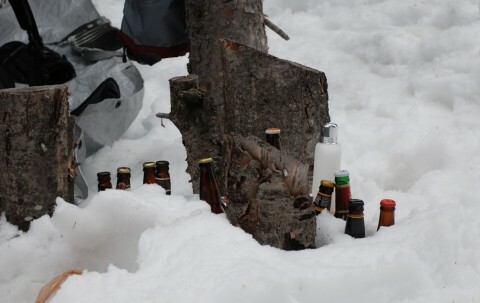 The snow makes for a good cooler. Sticking the bottles in the snow keeps them from getting too warm on sunny spring days, and too cold in sub freezing temperatures. And a light cover will keep the bottles from getting light struck and skunked. That was not a problem last Saturday since we had cloud cover and flurries most of the day. Big, strong beers are the norm at this outing for our group. (though Charlie did bring a cold pack of Session Lager one year) I like to organize what I call the “Doppelbock challenge.” We’ll bring up four different types of Doppelbock and all sample them and compare notes. It is a great way to warm up before dinner. This year’s victims were Paulaner Salvator, Spaten Optimator, Weltenburger Kloster Asam-Bock, and Sam Adams Imperial Double Bock. All are wonderful beers and highly recommended. You can pick your favorite after trying them all for yourself. And after dinner we compared and contrasted two different sounding, yet similar beers: Thomas Hardy’s Ale (and old ale) and Flying Dog’s Horn Dog (a barley wine). I have always loved Thomas Hardy’s, but it is very expensive. Horn Dog is not cheap either, but a touch more reasonable, and I feel it is an excellent American made alternative for Thomas Hardy’s lovers. The two ales taste very similar, but we all agreed that Thomas Hardy’s was a touch more complex, a little sweeter, and with more dried fruit character. They were both excellent, and as the Horn Dog ages, it too may develop similar flavors. It is hard to beat either of these beers if you can get your hands on them! A couple of final notes. I love my plastic camping “Pilsner” beer glass that I bought from REI. (see photo) The base unscrews and snaps on the top for easy packing. It is very light and extremely durable. In addition, I can store my Whisky glass inside the beer glass to keep it safe while in my pack. I have to drink my Laphroaig 10 year out of a real glass, not plastic or titanium. For this purpose, I simply use a 5 oz “taster” glass that many brewpubs use. It is glass, but more sturdy than the Riedel crystal Whiskey glass that I use at home. And the camping glass protects it. Another accessory I recommend is the “Jammit Personal Outdoor Table.” (http://www.mtmcase-gard.com/products/camping/camp.html) These things crack me up. The Jammit makes a great table, and if you are ever attacked by a bear, you can pull it out of the ground and use the business end to fend off the beast. They are so dangerous they should come packaged with a set of lawn darts. So if you buy one make sure to be careful after your own Doppelbock challenge!